Sue and I recently returned from 10 days in the Walla Walla AVA — half spent attending events sponsored by the Walla Walla Wine Alliance celebrating the AVA’s 30th birthday through a celebration of its wines and half with the American Association of Wine Economists who met at Whitman College. As we drove back over the Cascades towards home base in Tacoma, we talked about key takeaway messages and at the top of both of our lists was the region’s coming of age. We’ve visited Walla Walla many times over the years and watched it grow and change, but without ever having a sense that it had achieved its potential. Maybe it is because we had more time on this visit or maybe it is because we had so much access and guidance (from the Wine Alliance as well as from our growing list of winemaker friends there), but somehow this time it all came together and I will use the next few columns to tell you how and why we came to this conclusion and what it might mean. A number of factors contributed to our view but as fortune would have it a single event sort of summed up the moment. We were up on a hilltop on the Oregon side of the AVA for a festive dinner at the Glass House at the Caderetta vineyard and we tasted a number of Bordeaux blend wines with the meal. 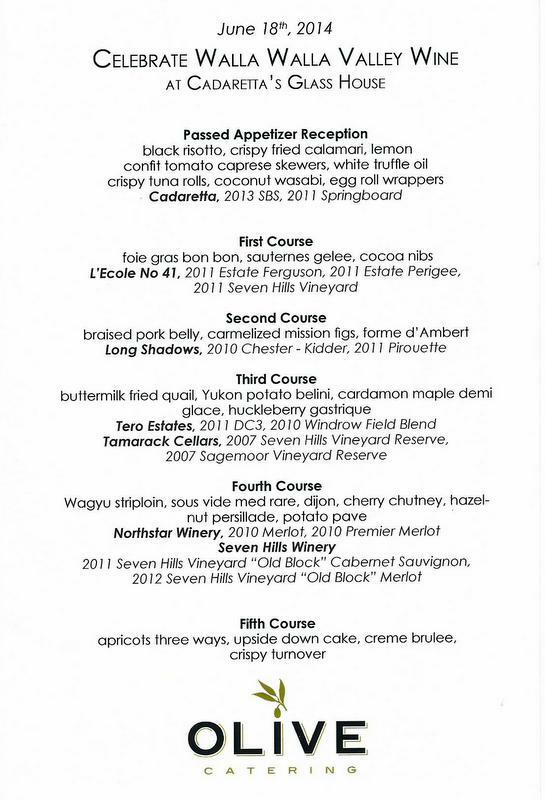 (Scroll down to view the wines and menu for that dinner.) Marty Clubb of the Walla Walla pioneer winery L’Ecole No. 41 was there and we tasted his 2011 Ferguson Vineyard blend. I think we could actually see the recently developed Ferguson Vineyard over the hill from our vantage point. The wine was great, with a real sense of place (more to come about this in future posts) and Marty told us that he was about to fly off to London because of this wine. The L’Ecole team was so happy with the Ferguson that they had entered it in the Decanter World Wine Awards and he had been summoned to London for the awards dinner. The invitation meant that the wine had won one of the bigger prizes — not just a bronze, silver or gold. Maybe a regional trophy (best U.S. Bordeaux variety wine?) 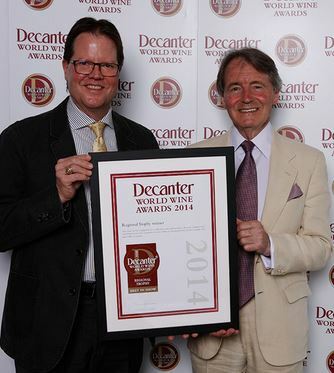 or maybe even an International Trophy (best of all the wine in this category from all over the world!). No way to tell which it was, but he was willing to fly to London to find out. How exciting! A couple of days later I was busy hitting the F5 reload key on my laptop, impatient to see the Decanter results appear on my screen. And finally at 1:01 pm there they were. L’Ecole won the International Trophy for Best Bordeaux Variety Red Wine over £15 –– the top award in what must be one of the most competitive wine categories. Wow — I couldn’t stop smiling when I learned that. Happy for Marty and his team. And happy for Walla Walla and Washington — great recognition for their wines. And a sign of Walla Walla’s coming of age, don’t you think? I don’t know if I was lucky or not, but I got the news when I was surrounded by my academic wine economist colleagues, who are intensely skeptical of wine competitions and rankings. I think it is possible they have collectively devoted far too much of their very considerable intellectual firepower to proving what I think is obvious — that judging wines, even using expert tasters and careful protocols, is more subjective art than objective science. Winning a Decanter award or any other obviously doesn’t prove that one particular wine is objectively “better” (whatever that means) than any other. But, I would argue, it is hard to deny that the excellence of the L’Ecole Ferguson stood out to the initial American tasting panel, which is how it entered in the International Trophy competition. And it obviously stood out there, too, when tasted with similar wines from other parts of the world. Not rocket science, I agree, but still worth celebrating. Best in the world? That’s a matter of opinion. But a sign that Walla Walla has come of age? Absolutely yes! And while LEcole is not the only Walla Walla winery set to take a place on the national and global stage, it is a very good example for us to study. The Ferguson vineyard itself, for example, shows L’Ecole’s determination to expand production without diluting quality and, at over 40,000 cases, L’Ecole is now large for a Washington producer (although everyone is small compared with Chateau Ste Michelle and its sister wineries, which together produce well more than half of all the wine in the state). L’Ecole’s recently re-designed label also suggests a thoughtful approach to moving into the national spotlight. The old label was a playful rendering of the historic schoolhouse that serves as the winery tasting room today in the tiny town of Lowden, which was known in days past as Frenchtown because of the French settlers there. The new label keeps the Frenchtown schoolhouse image, but updates it and presents the wine in an elegant way that communicates quality to a broader audience while respecting the heritage of the winery and the region. Is the L’Ecole Ferguson’s award the whole “coming of age” story? Far from it — I’m just getting started. Stay tuned. Before I go: Here’s a brief video that Marty Clubb made before his London flight. I include it here because it anticipates my next column, but also because it gives you a sense of our experience talking with Marty on that high ridge overlooking the Ferguson vineyard last month. Enjoy! Thanks to everyone we met in Walla Walla for their help and hospitality. Special thanks guide extraordinare Sharon Ferraro and to Duane Wollmuth and Heather Bradshaw of the Walla Walla Wine Alliance. Here’s the menu from the dinner at the Cadaretta glass house. Enjoy!